Istanbul is located on 32km (~20 mi) of the Bosphorus Strait, a coveted stretch of water connecting the trade routes of the Black Sea to the Sea of Marmara and the Aegean. It divides the city between Asia and Europe. Turks call the Bosphorus 'BOGAZ', with only one word or 'ISTANBUL BOGAZI'. A stay in Istanbul is not complete without the traditional and unforgettable boat excursion up the Bosphorus. Bosphorus shores offer a delightful mixture of past and present, grand splendor and simple beauty. The best way to see the Bosphorus is to board one of goverment run the passenger ferry boats that regularly travel zig-zags between the Asian and European sides of the shores. You can board this type of ferry in the Eminonu district and travel between the Asian and European sides of the Bosphorus. You can also take the tour by privately run passenger boats. They depart from Eminonu side of the Galata Bridge and also from Ortakoy<?I> pier (from the pier near Ortakoy Mosque), which is a nicer part of Istanbul. The round trip excursion is at a very reasonable cost and takes about six hours. We suggest checking the schedule prior to leaving your hotel. - The Museums, Mosques, Churches, Palaces and Bazaars . . .
- - - - - - - - - - - - - - witnesses of the history makes up for a separate richness of the city of Istanbul. Istanbul is one of the world's and Turkey's largest city, is home about 16 million people and is still growing as people move there from rural areas to find work. It is unique among the cities of the world, having one foot in Europe and the other in Asia. Istanbul is Turkey's economic capital and biggest trade center, home to nearly half of the country's wealth. Much of Istanbul is hilly and especially in the old part many of the streets are steep and narrow. This big city spread over seven hills and surrounded on three sides by water and it is atonishingly beautiful. The city never sleeps in this noisy and very cosmopolitan city. The Turks always seem to take the mayhem in good spirit, and so when you visit, you should too. The twisting, crowded old city streets exude an infectious energy. 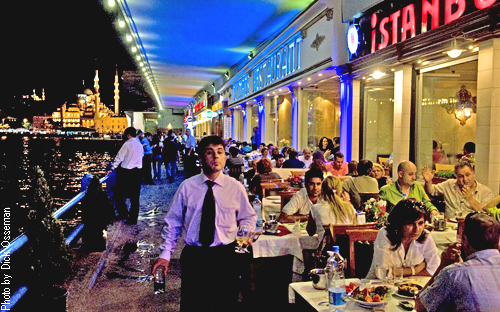 Like strong a Turkish coffee, Istanbul can be gritty, but its rich flavor is bracing! Istanbul is not a violent city. There are remarkably few assaults or robberies in which knives are used, not guns. But sometime pickpocketers work in tourist areas and few street crime usually takes a more subtle form. Historically, Istanbul has existed since before the building of the ancient port settlement of Lygos between the 13th and 11th centuries B.C. Later it became know as Byzantium. Still later, it was conquered by the Romans and became the capital of the Roman Empire under Emperor Constantine the 1st and became known as Constantinople. In AD 395 the Roman Empire split into the Western Roman Empire and the Eastern Roman Empire with Constantinople as the capital of the Eastern the Roman Empire which was also called the Byzantine Empire. In May 29th, 1453 Constantinople fell to 'Fatih' Sultan Mehmet II, (Turks call him by 'Fatih', the Conqueror) and became the new capital of the Ottoman Empire and was renamed - Istanbul. It continued as the capital of the Ottoman Empire until October 13, 1923 when Mustafa Kemal Ataturk established the Republic of Turkey and moved the capital to Ankara. The two parts of Istanbul are separated by the Bosphorus (also spelled Bosporus and called 'Istanbul Bogazi' in Turkish). This 32 kilometer (~20 miles) body of water opens into the Black Sea (Kara Deniz) in the north, and to the Sea of Marmara and continues to the Dardanelles (Canakkale Bogazi) and finally the Aegean (Ege Denizi) Sea to the west. Politically and economically, the Bosphorus is vital not just to Turkey, which under an international agrement controls it, but to all of the nations of the former Soviet Union which border upon the Black Sea (Kara Deniz). It is their only maritime connection with the rest of the world. If you are looking answer for your question "What to do and see in Istanbul", you are in a right website! Please see below and all the obtions located left column of this page. Istanbul Bosphorus Bridge (Bogazici Koprusu, in Turkish), is the 17th suspension bridge in the world (3,524ft / 1,074Mt). 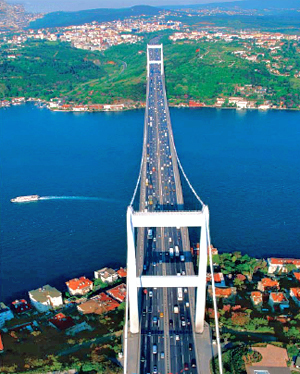 A third bridge on the Bosphorus is under consideration. 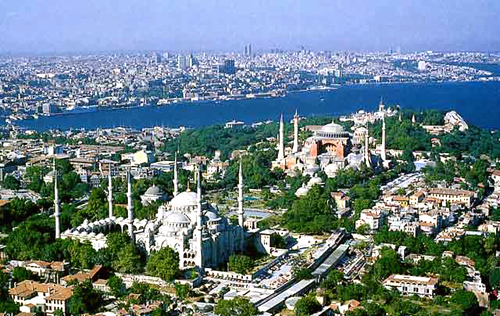 Istanbul is one of the world's largest cities, with about 16 million people. On October 29th, 2013, the 90th anniversary of the Republic of Turkey, 'MARMARAY' (pronounced 'marma ray'), a railway tunnel underneath the Bosphorus Strait has been opened in Turkey which creates a new link between the Asian and European shores of Istanbul. The tunnel is the world's first submerged railway connecting two continents, between Europe and Asia. MARMARAY registered itself as world's deeper tunnel in the world (its nearest opponent, 'Bart' in san Francisco, USA) and runs 180 feet below sea level. The name MARMARAY comes from combination the name of the 'Sea of Marmara', which lies just south of tunnel site, with 'ray', the Turkish word for rail. Istanbul remained with in the boundaries of the city walls built by Theodosius II in the 5th century throughout the whole of the Byzantine period and indeed until towards the end of the Ottoman period. Istanbul's Walls (Istanbul Surlari in Turkish) stretches 7 kilometers from the Sea of Marmara to the Golden Horn (Halic) and they have been restored previously and again recently . UNESCO has declared the land of walls and the area which they enclose, one of the cultural heritages of the world. will be unforgettable in this eclectic city. Istanbul, which once served as the capital of the Roman, Byzantine and Ottoman empires, has been designated as a cultural capital along with the German city of Essen and the Hungarian city of Pecs. The title, designated by the European Union as a showcase to depict cultural life and development, is anticipated to revive heritage and creative capacity of culture in Istanbul, also viewed as a great opportunity to enhance Turkey's image and sound its name. The first Turkish city to be given the title, Istanbul hopes to increase its number of visitors from 7.5 million to 10 million with around 170 cultural events throughout the year.
" I am leaving half of my heart in Istanbul "
Because of it's location between Asia and Europe, Istanbul has always had a great geopolitical importance in the world. Now Istanbul is an international art and cultural center. The International Arts and Cultural Festival is held each year in June with participation of many artists from around the world. 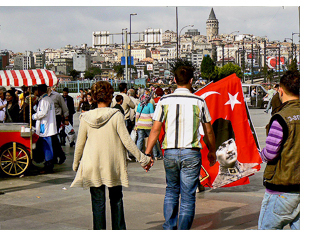 Istanbul's cultural heart and soul is Beyoglu district. 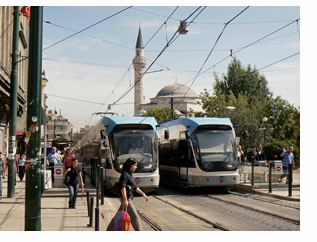 Beyoglu is in old section of the city and covers Taksim-Galatasaray corridor to historical mini subway tunnel (Tunel). Beyoglu offers galleries, theaters, opera, night life, fine boutiques and dining. The best way to see the Bosphorus is to board one of the passenger ferry boat at Eminonu district (Yeni Cami side of Galata Bridge). These Government operated passenger ferries and some private boats follows the routes designed especially for tourists who wants see the most on Bosphorus. When you visit Istanbul take your camera with you and do not miss this excursion tour! Purchasing on-line ticket is available by Turkish Maritime Line. See web-link at left side column of this page. Also this is important that when you are around the city, keep with you the list of emergency & all the important phone numbers. The Sultanahmet (pronounce sool-tahn-ah-MEHT in Turkish) square is the Istanbul of postcards and history. This area of historical peninsula has witnessed more history than most countries. 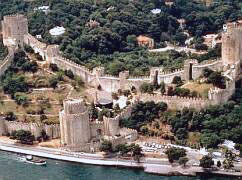 It is located at the heart of historic Old Istanbul and dream to see place for many visitors. At Sultanahmet square Istanbul's most important historical, cultural, and touristic places are in walking distances, such as; the Topkapi Palace, St. Sophia (Hagia Sophia), the Blue Mosque (Sultanahmet Cami), the Archaeological Museum, the underground Yerebatan Sarayi), the Sultan Ahmet III fountain, the Egyptian Obelisk, the Mosaic Museum, the Beyazit Square with its Mosque and tower, and the famous Grand Bazaar. Whole district of Sultanahmet , named for the Ottoman Sultan Ahmet, the 3rd, builder of the Blue Mosque, which is the the same area where other major historical treasures are located: Saint Sophia (also call as Hagia Sophia) and Topkapi Palace. In history this area was a horse-racing track (Hippodrome) that was the sporting and social center of Constantinople, capital of the Byzantine Empire and the largest city in Europe. At that time, as many as 100,000 people could be seated there to listen to political orations, or to watch the popular chariot races. 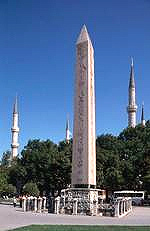 Today's Sultan Ahmet Square, other than two columns at the center of what had been the arena, little of the Hippodrome still exists. Several of 'Special Class' antique style hotels at historical houses are also located in this district. Plus, for those of you careful bargainer travellers Sultanahmet district can be a useful alternative for hostels and small hotels. If you found this website useful, please bookmark now and believe that you know others who may also enjoy this, please pass the word on. Thank you! CLICK HERE FOR MORE BOOKS ! Any foreign tourist whos wishing to know Istanbul closely, should spend at least a week in this magnificent city. Other wise you might run out of things to go and look at. MOSQUES... are the main religious buildings in Islam and usualy the most important structures in a Moslem city or town. The essential features of all Mosques include a MIHRAP, a gate and MINARETS. DO YOU KNOW HOW TO SPEAK TURKISH? "I am glad to be here"
Then he or she will ask you: NASILSINIZ? The above conversation can be applied in any conversation.